This bright and comfortable vacation home has 2 balconies, 2 sleeping rooms, a living room, a separate fully-equipped fitted kitchen (with coffee machine, toaster, water boiler) and a tiled bath room with a shower and a bath tub, hair dryer and WC. 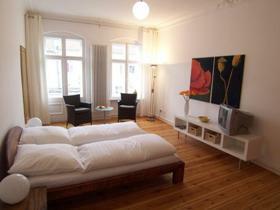 Each sleeping room has a double bed and the living room has a double sofa bed. Include a radio, internet connection and TV's in the living room and in each sleeping room. That apartments has a pleasant atmosphere. You will feel like at home. This apartment has heating, fluently hot and cold water. It is located in a quiet side street. Baker shops, supermarkets, bars and restaurants are close by within few minutes walking distance. Berlin-Mitte-Wedding is part of the district called Berlin - Centre (Mitte); it is mainly shaped by old buildings and those dating back to the 1970s and 80s.The settlements calles Schillerpark and Friedrich - Ebert belong to the UNESCO WORLD HERITAGE . A visit to Leopold Sq. is highly recommended. There you can find the old and the new Nazareth Church. The regular markets and the neighbouring shops are well worth a visit. But Wedding also offers you green leisure centres and parks, where you can do all sorts of sports, games and other activities. Schillerpark, Volkspark Rehberge and Goethepark are most outstanding.